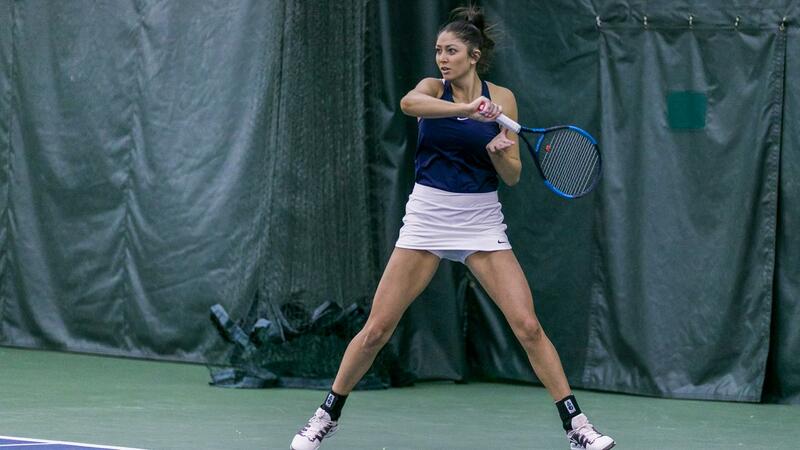 The BYU women’s tennis team opened its season with two back-to-back wins at home, winning a hard-fought season opener 4-2 against Boise State Feb. 8. The team followed its first season victory with an impressive 4-0 sweep of New Mexico Feb. 9. The Friday matchup against Boise State was hotly contested. BSU opened strong with a win in doubles, but the Cougars battled back the second and third matches. Taylah Beckman and Samantha Smith won their match for the Cougars, defeating BSU’s Wiktoria Nosek and Emily Strande 6-3. Beckman and Smith extended their unbeaten doubles streak to three games. WCC doubles team of the week Polina Malykh and Madeleine Almeida closed their match to win doubles the Cougars. Malykh and Almeida also extended their unbeaten streak in doubles to three, with their 6-4 win over Boise’s Frankie Trella and Vanessa Timm. The Broncos opened up strong once again in singles, winning the first two matches. Almeida was the first to win a singles match for the Cougars, showing signs of the tide turning in favor of the BYU women. With Smith winning her match in the second game, Beckman had the chance to close out her match to win it all for the Cougars. The first game of her match saw her opponent, Emily Strande, take a threatening 5-1 lead. Smith described Beckman’s key performance, praising her teammate. With her 6-3 win of the second game, Beckman closed out the whole match with Boise State for a 4-2 win for the Cougars. Beckman said the team members fought through the nerves that come with the season’s first game. She attributed the players’ ability to work through their nerves to their team spirit. The BYU women won an even more impressive matchup against New Mexico the next morning. The Cougars didn’t lose a single game of any match. Doubles saw Kate Cusick and the team’s new addition, Alina Menshykova, win their match decisively 6-3. Beckman and Smith closed out doubles for the Cougars, shutting down the Lobos with a 6-1 final score. They extended their unbeaten doubles streak to 4-0. Malykh and Almeida were well on their way to winning their match when doubles ended with an unfinished score of 5-2. Cusick, Malykh and Smith closed out Saturday morning matchup with the Lobos in style, winning each of their matches in the second game.